If mankind had never seperated from God, religion would not have existed. When mankind at last returns to God, religion will once again not be required. If religion is not required, then will a religious language be needed? Hmmm… That’s an interesting question! 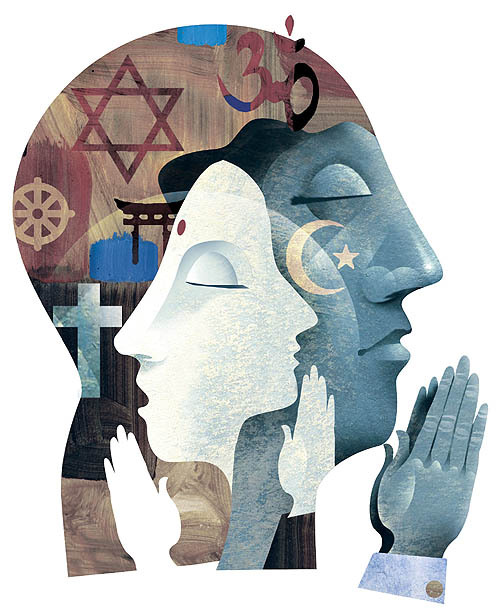 I’m starting to think of different religions as different languages to approach God by, meaning that none of them are inherently superior or “right.” I don’t think that having multiple “languages” is a bad thing; it’s simply an expression of the different cultures, ways of thinking, and people that live in this world. But, I suppose that if mankind were to really return to God, there would be an entirely different level of “oneness” with the divine, which I think would mean no “language” would be necessary. So… all of that to say no. XD But for now, with so many different views on spirituality, people must learn to let others “speak” the religious language that they understand most fully. Oh, and thanks for your thoughts! They’re greatly appreciated! I think that perhaps you may be right, would language be required in a ‘Oneness’? Do I need a language to speak to myself? Hmmmmmm. The concept I’m evoking of “languages” of spirituality is mostly a metaphor for greater religious understanding. If we think of our communication with God or the divine as a language, then we can be okay with not fully understanding other individuals’ approaches. But if/when we’re part of that spiritual oneness, the distinction of languages is perhaps, as you said, not required.